The iconic 2013 Volkswagen Beetle Convertible is coming back to the U.S. market and makes its world debut in LA. The 2013 Volkswagen Beetle Convertible is back and will be launched in the U.S. shortly after it makes its world debut at the Los Angeles Auto Show. Volkswagen will launch the new 2013 VW Beetle Convertible next month and it will be priced from $24,995. The new soft-top Beetle will be more powerful, sporty and fuel-efficient. The new soft-top will open on the fly in just 9.5 seconds. The new 2013 convertible is wider and longer than the last Beetle rag top and has additional laser welds for increased body stiffness. The new convertible has a lower roofline than the coupe’s and features a new heatable rear window made of tempered safety glass. The top latches and unlatches automatically at the touch of a button, which is located on the upper rail of the windshield surround. The top lowers in 9.5 seconds, raises in 11.0 seconds and can be raised and lowered at speeds of up to 31 mph, which is unusually high for a convertible. The 2013 Beetle Convertible comes well equipped with standard 17-inch aluminum-alloy wheels; a leather-wrapped steering wheel; an eight-speaker sound system with aux-in; Bluetooth; a Media Device Interface with iPod cable; three-color adjustable ambient lighting; heatable front seats and exterior mirrors; cruise control; and V-Tex leatherette seating. Available features include a multifunction leather-trimmed steering wheel, Keyless access with push-button start, leather seating, the RNS 315 navigation system, the award-winning Fender Premium audio system, and Sirius satellite radio. The split-folding rear seat makes the new convertible even more practical. The new Beetle convertible will be featured with three drivetrain options, a 2.5-liter five-cylinder engine mated to a six-speed automatic transmission; the 2.0-liter TSI turbocharged four-cylinder gasoline engine with six-speed manual or six-speed DSG dual-clutch automatic transmissions; and the 2.0-liter TDI turbocharged Clean Diesel with the six-speed manual or DSG options. The Beetle TDI Clean Diesel will be the most fuel-efficient convertible on the road. The 2.0-liter diesel produces 140 horsepower and 236 pound-feet of torque and has an EPA estimated fuel economy rating of 28/41 city/highway mpg when equipped with the manual transmission. Buyers can choose from a total of seven different models. Beetle Convertible with Technology starts at $26,695, and comes with a leather-wrapped multifunction steering wheel; Keyless and push-button start; Premium VIII touchscreen radio; high-line trip computer; and Sirius XM Satellite Radio. 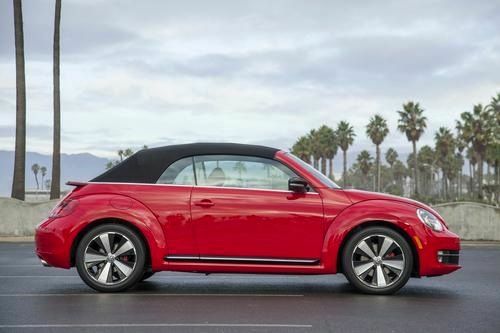 The Beetle Convertible with Sound and Navigation ($28,495) adds: 18-inch “Disc” aluminum-alloy wheels; the RNS 315 navigation system; and the Fender Premium Audio System. The ‘70s Edition’ adds chrome exterior mirror caps and a unique Toffee Brown metallic color, for $28,595. The Beetle TDI Convertible ($27,895), gets a leather-wrapped multifunction steering wheel; Keyless access with push-button start; a leather-wrapped gearshift knob; Sirius XM Satellite Radio; the Premium VIII touchscreen radio; and the auxiliary instrumentation cluster. The six-speed DSG dual-clutch automatic transmission adds $1100. The Beetle TDI Convertible with Sound and Navigation ($29,195), adds the RNS 315 navigation system and the Fender Premium Audio System. The Beetle Turbo Convertible ($27,795), adds the following equipment over the 2.5L model: a six-speed manual or DSG automatic transmission; a sport suspension; 18-inch aluminum-alloy wheels; aluminum-alloy pedals; black-finished exterior mirror housings; front foglights; a leather-wrapped gearshift lever; and the auxiliary instrumentation cluster. The Beetle Turbo Convertible with Sound ($29,195) adds a leather-wrapped multifunction steering wheel; Keyless access with push-button start; the Premium VIII touchscreen radio; the Fender Premium Audio System; a highline trip computer; and Sirius XM Satellite Radio. The Beetle Turbo Convertible with Sound and Navigation is the topline Beetle at ($31,195) and adds: leather seating surfaces, door trims, and dashboard; sport seats; and the RNS 315 navigation system. The ‘60s Edition’ ($32,395 ) has two-tone leather seats and Denim Blue paint: it is available only with the DSG transmission. The all-new 2013 Volkswagen Beetle Convertible will compete in the competitive convertible segment with the Fiat 500c, Mini Cooper Convertible, Chevrolet Camaro, Ford Mustang Convertible, and Mini Cooper S Convertible. If history is any indication on how well the new VW Beetle convertible will fair, this sporty iconic soft-top should sell well.